I am a huge advocate of foliar feeding. It can be preventative or corrective and it is highly effective. Foliar feeding does not benefit all plants equally. Tree and shrub species differ in their ability to absorb nutrients through their foliage. If research is not availability on a variety you wish to treat, a bit of trial and observation will be necessary to see if the plant you wish to treat will respond. Foliar feeding does not replace root feeding. It will not alleviate mineral deficiencies at the roots or the affect of those deficiencies on crown growth. The health of the Soil Food Web at the feet of your plants is crucial to adequate mineral nutrition. Foliar feeding is best done on cool or overcast days. This avoids the danger of leaf burn. When used at proper dilution rates, burning is seldom a concern, but until you know how a certain plant will react, stay on the side of caution. If the forecast does not indicate any periods of cool, overcast weather, choose to foliar feed early in the morning, or late in the evening. 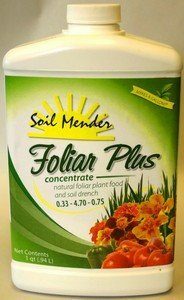 One way for serious gardeners to use foliar feeding is to use it as a test for mineral deficiencies. This is particularly effective in the edible garden, but can also be used on everything from the lawn to the azaleas. If a mineral deficiency is indicated, apply that mineral in a foliar feed. If the deficiency appears to quickly resolve, you have an indicator that a soil deficiency needs to be addressed. A thorough pursuit to determine the cause of the deficiency should be undertaken. It may be a matter of a gross deficiency, meaning a lack of that nutrient in the soil. It may also be a matter availability. A sufficient amount of a nutrient may be resident in the soil, but be bound up by an imbalance in nutrients or pH. Once the imbalance is rectified, the nutrient should be readily available, and the deficiency resolved. Foliar feeding is not intended as a means to deliver macro nutrients – NPK . This is not to say that the foliage will not absorb these macro-nutrients – they will – but not in effective amounts. 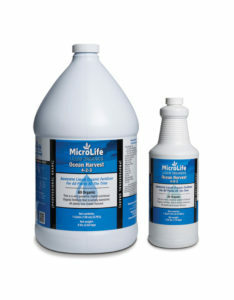 Micro-nutrients, minerals, are the only nutrients that are effectively applied through foliar feeding. Minerals applied in amounts that exceed the needs of the plant may cause injury to the plant tissues. In addition to this concern, there is also the legitimate concern that over-application may have an environmental impact. Too much of a good thing is not a good thing. Mix all products according to their directions, apply them properly, and dispose of any unused portions according to package directions. An interesting aspect of foliar feeding is that even the “naysayers” admit to its efficacy. What they don’t accept are the many claims found in the marketing of the products used for foliar feeding. I have to say that I am with them in that. Advertising sometimes takes on a life of its own. A simple statement from a researcher that says “plants readily take up nutrients in through their stomata and cuticle” somehow leads to exaggerated claims that “foliar feeding is 10 times more effective than root feeding”. These exaggerated claims don’t serve anyone well. They mislead the consumer, and strain the credibility of the manufacturer. A perfectly good product becomes suspect just because of the outrageous marketing. The processes of nature are complex. This includes its chemistry. There is no single product or practice that should be considered a magic bullet for every issue that presents itself. Foliar feeding is a solid practice. It is backed by both science and practice. Just make sure you have reasonable expectations. Know why you are using a foliar feed and how to use it properly. There are many products available for foliar feeding. We only use those approved for organic gardens, derived from natural resources. Sea-based products are valuable for foliar feeds. There are many minerals in seawater and these are absorbed by sea life. Seaweed extract can be applied weekly to the entire garden quickly via a hose-end sprayer. Spot treatments can be applied with a pump-up sprayer.